I stand up not only against Domestic Violence. but also Animal Cruelty. At times when I’m advocating against Animal Cruelty I have people who initially jump down my throat over it, they tell me I should worry about humans instead, how can I be so heartless to place animals above children. The truth is, I don’t, instead I hold them both equal. Both Children, and animals are both innocent victims who depend on adult humans to show them love and protection. 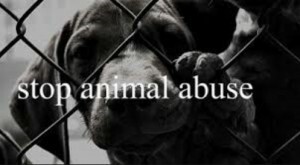 If you’re truly educated on the subject of Domestic Violence you will know that #DV and Animal Cruelty go hand in hand. Animals feel the effects of Domestic Violence in the homes where they live. They go through the same emotional stress, & fears that human #dv victims experience. Besides the emotional effects of #dv most pets become a physical victim to the violence within the home. Abusers will threaten to hurt, or hurt a victims pet. One reason victims stay in violent homes are because they don’t want to leave their pets to be hurt. They risk their own lives to keep their pets safe. That’s crazy you say? It’s no different from leaving behind your human child just so you wont be hurt anymore. We can take our human kids into #dv shelters with us, but our furry kids have nowhere to go. Boarding Kennels want money to temporarily house your pets, animal shelters just expect you to surrender them, what else can you do? Many women can’t have children and they see their pets as their kids. It really isn’t any different. Abusers usually first start hurting animals before they ever move on to hurting other humans. As a matter of fact a big red flag to anyone is someone who hurts, or even jokes about hurting animals. If they would hurt a pet, they will just as easily hurt you.When you see this in someone I suggest you run. I’ve tried to network with animal shelters & rescues that are willing to work with #dv victims to house their pets while staying in #dv shelters, but have yet to find any. However, I read an article the other day about a #dv shelter in florida opening space to house victims pets on site and thought it was an even better idea then what I was trying. How could this possibly help you ask? It will not only help tackle domestic violence but also animal cruelty by removing BOTH victims from the situation. If a #dv shelter has space for pets more victims will leave faster than before. They and their pets will both be safe from harm. Keeping pets on site will also help emotionally for both victims. On site pets can even aid the emotional state of other victims & children staying in the shelter who don’t own pets. It’s a win, win situation. The sooner everyone see’s and understands how both Domestic Violence & Animal Cruelty go together the sooner we can bring both to an end. You can stand for both causes, actually you must. We need to start helping raise funds for our local #dv shelters to follow the shelter in Florida and add space for pets. Those of us who are animal lovers can also volunteer to help with pets while there, raise more funds to supply food & other necessities for them. Stand for both causes, if you don’t, you really don’t stand for either one in the first place!